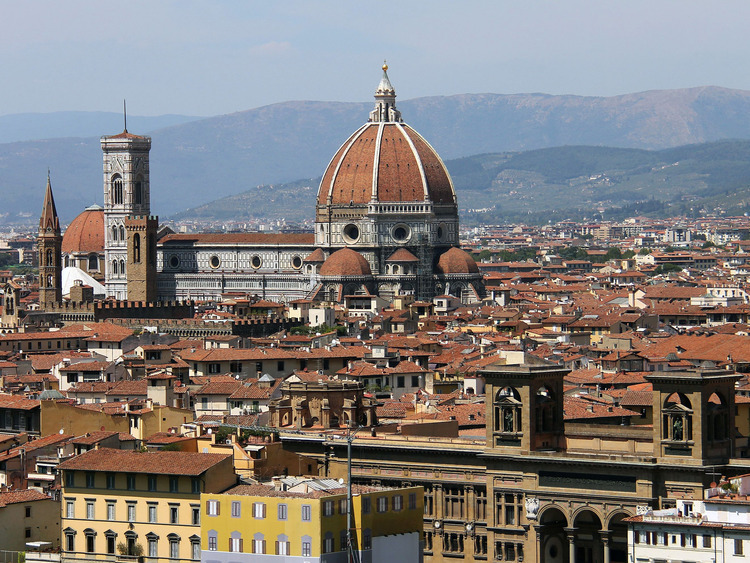 We'll be able to explore the centre of Florence on foot, including the marvellous Piazza del Duomo, the heart of the city. We cannot fail to be impressed by the beauty of the imposing works of art that surround us in a wealth of red, white and dark green marble. It is here that we find the most important complex of religious buildings in the city: the Baptistry of Saint John, with its three magnificent, bronze doors by Pisano and Ghiberti, and the Cathedral of Santa Maria del Fiore  with its enormous dome by Brunelleschi  and the bell tower designed by Giotto, two of the finest examples of 13th century Florentine Gothic architecture.